While cloudy days present a challenge with the light, they also provide for opportunities to capture some brilliant details in an otherwise contrasty subject. 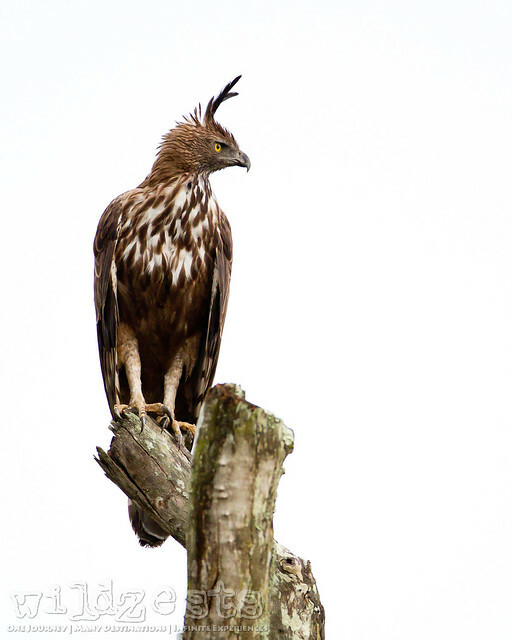 The Changeable Hawk Eagle's brown plumage has shades of white on the under belly and it can get quite challenging to get the exposure right if there is bright light. On the other hand, a cloudy day really helps in keeping the highlights from blowing out and at the same time, can be used for some brilliant hi-key portraits like this one. These raptors would usually perch high up on a bare tree which gives them a good vantage point and clear visibility too. Photographing them against the sky is a challenge if the sun is shining bright, but a cloudy sky can make a huge difference. Make sure that you intentionally dial up the exposure on such hi-key images since otherwise the camera would want to bring down the whites into grays and the resulting image would have some loss on the shadow details due to underexposure.